If you're a dark chocolate lover, perhaps you're addicted to the sweet treat's nutritional benefits. Eating dark chocolate provides you with energy, fat, minerals and antioxidants to help support your overall health. These benefits come from the cocoa beans. Manufacturers roast, grind and mix these beans with cocoa butter and sugar to form a chocolate bar. Check your dark chocolate's percentage of cocoa; it is listed on the wrapper. Keep in mind that the higher the number, the darker the chocolate. The calories in dark chocolate make it an energy-rich food. It provides about 530 calories per 100 grams. You'll also get varying amounts of sugar and fat from dark chocolate, depending on the amount of sweetener and fat used to make the chocolate. These numbers hold consistent across brands, according to a July 2017 report in the Global Journal for Research Analysis. Because it's such a rich source of calories, fat and sugar, chocolate can cause side effects. You should eat chocolate in moderation, particularly if you're trying to lose or manage your weight or have diabetes. Eating dark chocolate provides you with a variety of minerals, including iron, magnesium, copper and manganese. A November 2016 paper in the International Journal of Food Sciences and Nutrition documented these nutrients in several chocolate products. Eating 100 grams of dark chocolate gives you 252 milligrams of magnesium. This amount satisfies 67 percent of your daily need. Eating 100 grams of dark chocolate also gives you 11 milligrams of iron. This amount takes meets 80 percent of your daily need. Chocolate also offers you a significant amount of selenium and zinc. Using chocolate to get these minerals can help you avoid medical conditions like anemia. Dark chocolate also gives you a variety of antioxidants including polyphenols. Antioxidants help prevent damage in your body caused by oxidative stress and harmful free radicals. According to a September 2013 review in Nutrients, consuming polyphenols may lower your risk of developing chronic diseases, such as heart disease, cancer, diabetes and osteoporosis. The antioxidants found in chocolate may also help improve your overall immune function to prevent other types of illness and disease as well, according to a December 2017 paper in Frontiers in Nutrition. If you crave dark chocolate, you may want the stimulant compounds present in chocolate. Both caffeine and theobromine in chocolate excite or stimulate your central nervous system, helping to temporarily reduce drowsiness or fatigue. They may also relax certain smooth muscles, such as those in the throat and lungs, helping to relieve cough and open restricted airways, according to an October 2018 report in Trends in Cardiovascular Medicine. However, if you consume these compounds in excess, they may cause headaches, rapid heartbeat, anxiety, restlessness, insomnia and nausea. 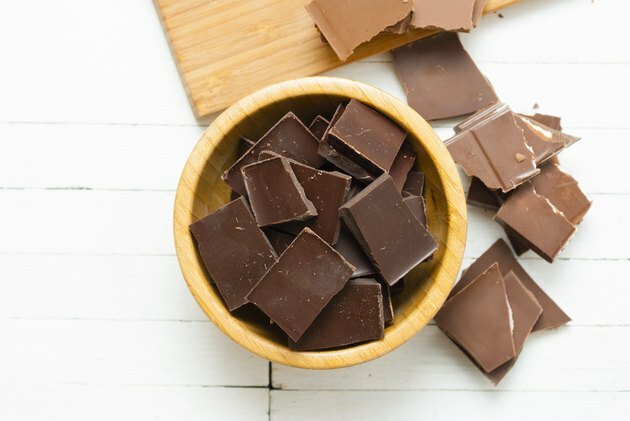 LIVESTRONG.COM: What Is the Difference Between Baking Chocolate & Chocolate?